The dong quai herb has enjoyed millennia of popular use in Asian cultures, but it has only recently become well-known worldwide, due to its great medicinal properties. As one of the fundamental components of the traditional Chinese medicine (TCM), dong quai benefits have been valued throughout Asia, where the root is also called Radix angelicae sinensis and it has been used as an everyday tonic and herbal medicine for centuries. Today, dong quai properties are believed to greatly contribute to human well-being, although women are thought to reap the most advantage, and the herb is often referred to as "female ginseng." Improving vascular health. Dong quai has been shown to increase blood flow, reducing the risk of clotting that can lead to thrombosis and atherosclerosis. Reducing osteoporosis. Dong quai has been shown to enhance calcium absorption, slowing down age-related bone mass loss. Regulating estrogen levels. Dong quai has been traditionally used for relieving premenstrual syndrome (PMS), as well as for reducing the severity of menopause symptoms. Dong quai health benefits include improving anemia. 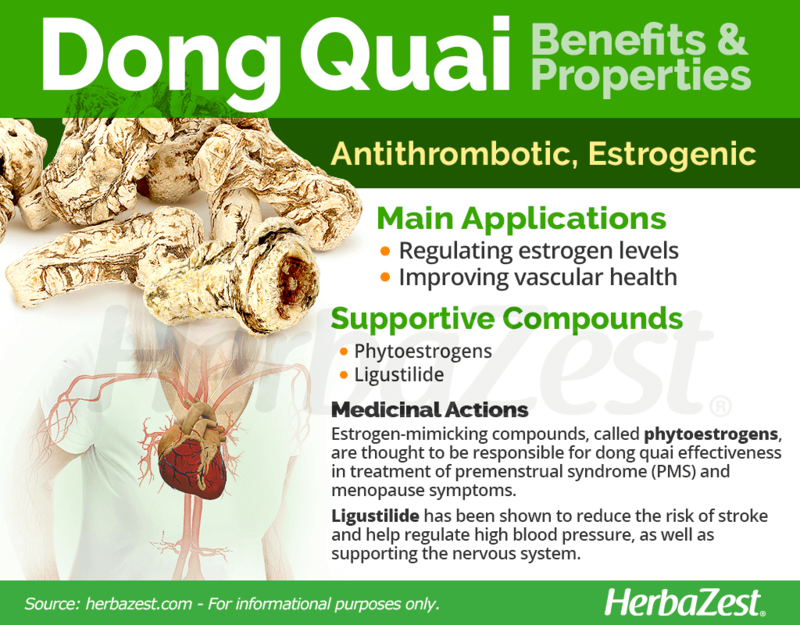 A variety of unique estrogen-mimicking compounds are responsible for dong quai properties, and make it an effective herb for female use. Ligustilide is a major compound in dong quai, and it is thought to be mainly responsible for the antioxidant and antithrombotic activities of the Chinese angelica root. Ligustilide has been shown to reduce the risk of stroke, improve cognitive and behavioral disorders caused by central nervous system dysfunction, and help regulate high blood presure. Very little research has been done on the alleged estrogenic properties of dong quai. While some studies suggest estrogen-like effects, others report a minimal interaction of the Chinese angelica root's biocompounds with the endocrine system. However, a study have shown both anti-estrogenic and anti-androgenic activities in Dong quai extracts. While the exact estrogenic mechanisms of don quai is yet to be fully explained, the traditional uses of the herb for treating PMS and menopausal symptoms encourage further research. On the other hand, carvacrol and sesquiterpenes contribute to dong quai's anti-inflammatory effects. The courmarins, phytosterols, ferulic acid, and polyacetylenes also present in the herb's makeup act as pain relievers and muscle relaxants. Other herbs with hormone balancing effects, which help relieve PMS and menopause symptoms, are alfalfa, maca, and soy, whereas lucuma, olive, and sacha inchi provide cardiovascular benefits as well. Dong quai can make the skin more sensitive to the sun, potentially resulting in inflammation and burns. To counter this, those taking dong quai should stay out of the sun or apply ample sunscreen. Pregnant women should not take dong quai, as it may induce miscarriage. Children and breastfeeding women should not take this herb. It is also contraindicated in people with chronic diarrhea and bloating and women at risk of reproductive cancers. Dong quai may interact with blood thinners and hormone medications, whether herbal or pharmaceutical. Dong quai health benefits, based on the phytonutrients of the Chinese angelica root, are often used in Asian cooking. Dong quai dosage for medicinal consumption is not well established, so it is important that those wishing to take it first see a physician to find out the proper amounts for them. The Singaporean pork-based dish, bak kut teh, is perhaps the most well-known dish to feature the Chinese angelica root. Raw. In Asian cuisine, dong quai root benefits are frequently obtained by chopping it up and adding it to soups, sometimes also using it as a topping for dishes with tofu. Dried. The desiccated root of dong quai can be chopped and prepared into infusions in order to relieve both PMS and menopausal symptoms, as well as for naturally controlling high blood pressure. Powder. Dong quai powder is very popular and it preserves all the active compounds responsible for dong quai health benefits. It can be brewed, as well as added to juices, smoothies, and even baking goods. Infusion. A dong quai tisane can be brewed by adding one teaspoon of the Chinese angelica root to one cup of hot water. Tincture. A dong quai tincture can be taken for relieving menstrual pain. Since this preparation is composed by nearly 70% alcohol, it needs to be diluted in a glass of water. Capsules. Supplements provide a consistent dosage of dong quai. They are typically prepared from powdered Chinese angelica root. Injections. Injections are administered at hospitals in China and Japan, but they are not widely available or meant for home use. 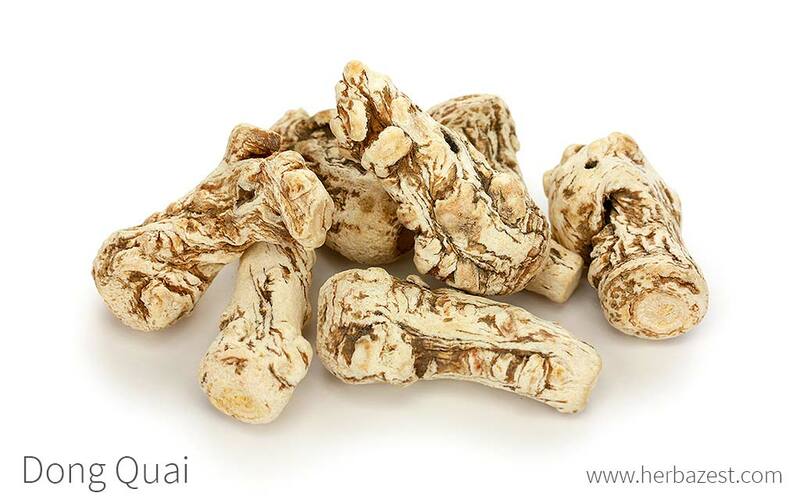 While it is possible to buy dong quai seeds for gardening purposes online, the fresh dong quai herb can be difficult to find in Western countries, but it is possible to find dried versions of the Chinese angelica root in some specialized health food stores and ethnic markets. Teas and herbal spice packets that include it for cooking can be found at similar locations or through online retailers. 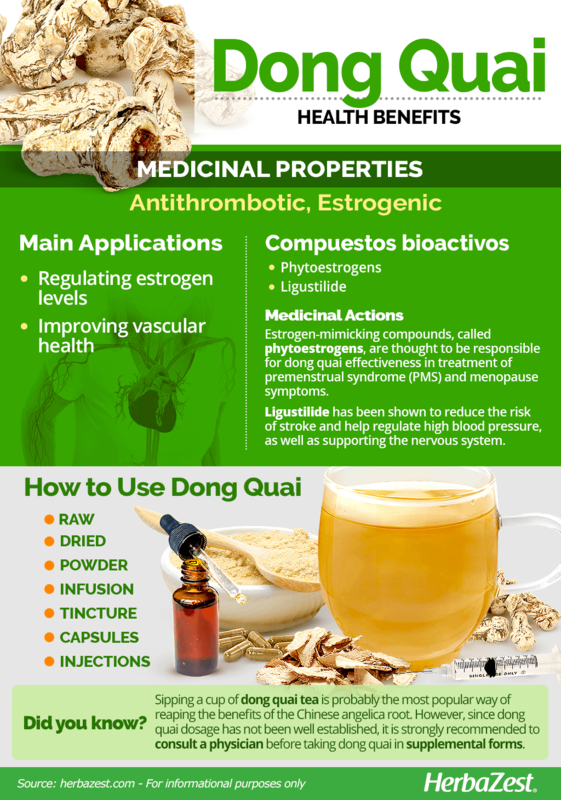 Herbal supplements containing dong quai can be often be found internationally, alongside other common dietary aids at pharmacies, herbal shops, major wholesale retailers, or online. They will often come in several different forms, including capsules, pills, tablets, and ready-made liquid extracts. Worldwide popularity has also led to a variety of brands, concentrations, and price points becoming available. Since dong quai dosage has not been well established, it is strongly recommended to consult a physician before taking dong quai in medicinal amounts. The dong quai plant (Angelica sinensis) is a fairly hearty perennial, seldom grown outside of its natural habitat, but if the right conditions are met, it is possible to cultivate it in a home garden. The dong quai plant can survive temperatures down to 23°F (-5°C) or even lower, conditioned to harsh climatic change in its native mountainous environment. Ample sunlight is not necessarily essential to its development, as dong quai can be grown in either partial shade or full sun. Fertile soil that is rich in organic matter however, makes all the difference in regards to proper growth and root development. Seeds should be planted in the early spring and watered regularly. After three years, the dong quai roots or rhizomes should be ready for harvest. The dong quai plant (Angelica sinensis) is a perennial that can reach up six feet (2 m) tall, and has a sturdy, hollow stem that supports large green leaves. Clusters of white flowers appear in the summertime, but they have almost no medicinal value compared to the plant's deep, spreading roots or rhizomes, called Radix angelicae sinensis in Asia, and Chinese angelica roots in the West. These are often brown on the outside but lighter within. Dong quai belongs to the Apiaceae family, a group of over 3,700 different species that houses staple crops of great economical and medicinal importance, such as carrot (Daucus carota), fennel (Foeniculum vulgare), celery (Apium graveolens), and dill (Anethum graveolens). While there are approximately 50 species in the Angelica genus, Angelica sinensis - Chinese angelica - is the only true version of dong quai. It is, however, sometimes mistaken for closely related species native to other continents. Angelica atropurpurea, or American angelica, is similar in structure but less aromatic; and Angelica archangelica, or European angelica, is beneficial for overall health and provides other medicinal benefits, but it is significantly less potent. Hailing from the swampy, mountainous regions of China, Korea, and Japan, the dong quai herb has been consumed by humans for well over 2,000 years, and the first mention of Angelica sinensis can be traced back to Chinese medical texts from 400 BCE. It was not until late in the 19th century that dong quai made its way to Europe, in the form of a proprietary preparation for treating gynecological disorders. In ancient Chinese tradition, dong quai is described as a tonic that rebalances qi (chi), an abstract concept that connects energy to the immune system. Statistics demonstrate that 70 - 80% of the Asian population uses herbal medicines on a regular basis, and, as one of the most popular remedies of all, dong quai is among the top tier products used. China, Korea, and Japan produce and consume the greatest quantity of the herb, though supplements have become a popular export: in 2011, over $102,000 USD worth of the Chinese angelica root were sold in the United States alone.